This exercise is best performed inside a squat rack for safety purposes. To begin, first set the bar on a rack just below shoulder level. Once the correct height is chosen and the bar is loaded, step under the bar and place the back of your shoulders (slightly below the neck) across it. Hold on to the bar using both arms at each side and lift it off the rack by first pushing with your legs and at the same time straightening your torso. Caution: This is a movement that requires a great deal of balance so if you suffer from balance problems you may wish to either avoid it or just use your own bodyweight while holding on to a fixed object. Definitely never perform with a barbell on your back if you suffer from balance issues. Variations: There are several ways to perform the exercise. One way is to alternate each leg. For instance do one repetition with the right, then the left, then the right and so on. The other way is to do what I call a static lunge where your starting position is with one of your feet already forward. In this case, you just go up and down from that starting position until you are done with the recommended amount of repetitions. Then you switch legs and do the same. A more challenging version is the walking lunges where you walk across the room but in a lunging fashion. For walking lunges the leg being left back has to be brought forward after the lunging action has happened in order to continue moving ahead. This version is reserved for the most advanced athletes. In order to make the training more diverse and effective you have to change the number of repetitions and the working weight. It is important not to go beyond certain values! *Specify the weight and the maximum number of repetitions that you can perform with this weight. You do not want to count by hand? Install the AtletIQ application! These programs with this exercise «Barbell Lunge» are among the best rated by athletes. 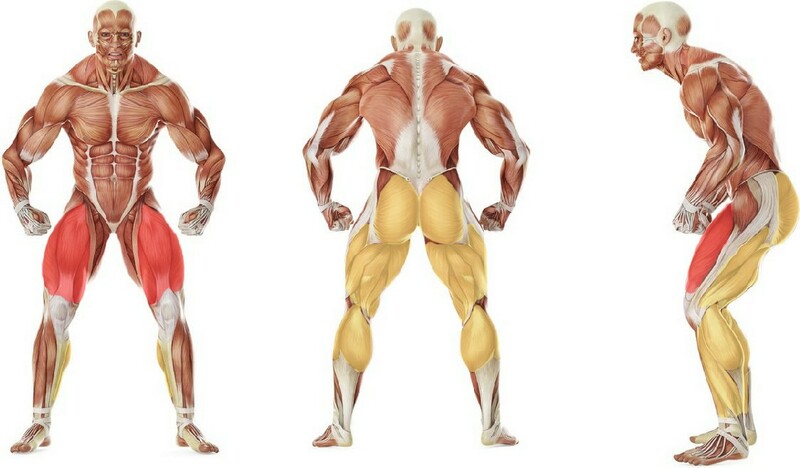 You can try replacing the exercise «Barbell Lunge» with one of these exercises. The possibility of replacement is determined on the basis of the muscle groups involved. "5 element": fire complex for the "fifth point"